Seattle Public Schools says enrollment projections for the 2018-2019 school year were short by more than 700 students. As a result, 33 teachers will either take a job in their expertise area at another school, or be assigned as substitutes in the same school. In response to news that teachers in 27 Seattle schools will be transferred this year because of low enrollment, students are planning a walkout and march to City Hall on Tuesday afternoon. 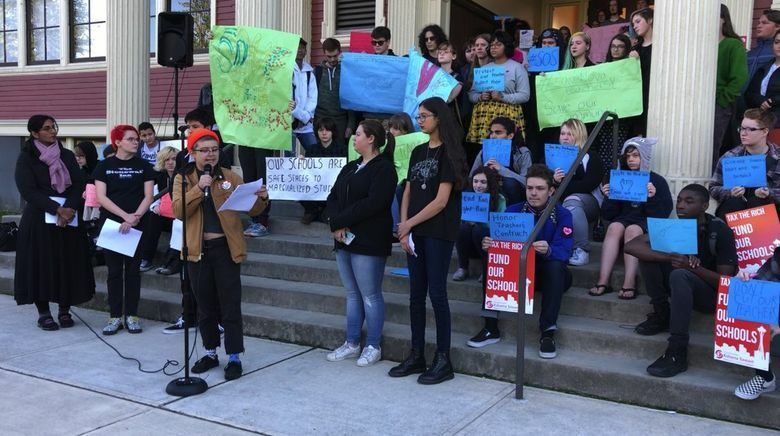 Students at The Nova Project, an alternative Central District school also called Nova High School, announced the walkout on the steps of their school Monday morning. They were joined by Seattle City Councilmember Kshama Sawant, plus a representative from a socialist youth coalition and Tracy Castro-Gill, who heads the ethnic-studies program at Seattle Public Schools and is the Puget Sound region’s 2018 Teacher of the Year. “The district talks big about equity, but they don’t show it,” said 16-year-old Nova student Mirabai Kukathas, who — along with other students — spoke to the media about the consequences of losing teachers at the school, where a significant portion of students identify as LGBT. The walkout will begin at 12:30 p.m. Tuesday, when students will march from Nova to Seattle City Hall. A letter signed by district leadership and sent to school principals last week said enrollment projections for the 2018-2019 school year were short by more than 700 students, which means about $7.5 million in lost revenue. (The district receives money based on how many students it enrolls.) The district made its projections last spring. It also says the 33 teachers affected will either take a job in their expertise area at another school, or be assigned as substitutes in the same school until other positions become available. Garfield High School, Roosevelt High School and Seattle World School are among the schools impacted by the cuts. In some cases, positions that were already vacant will stay vacant. Eleven schools, including Rainier Beach High School and Eckstein Middle School, will receive additional teachers. A district statement sent to The Seattle Times on Monday confirmed the accuracy of the letter, except for one school — Interagency Academy — which was re-evaluated and will not receive cuts this year. “We truly wish we had more budget flexibility to keep all schools whole,” said the statement, adding that student enrollment fluctuates across schools. None of the teachers will lose their employment contracts as a result of the staffing adjustments, the district said. Nova students began organizing the walkout once they heard their school would lose two of its teachers, and say that they’ve reached out to students at other high schools, including Garfield, that are expected to lose teachers. Though Nova’s enrollment is small — around 300 students during the 2017-2018 school year — students and staff say it and other alternative high schools receive an influx of transferring students from bigger schools a few weeks into October. Matthew Maley, a special-education instructional assistant at Nova, said the cuts would mean losing about eight classes. Mark Perry, Nova’s principal, declined to comment for this story. In response, the district said that after it found Nova was 65 students under projected enrollment, it should have lost nearly three full-time teachers. But it stepped in and shaved that number to two. “While the need was greater than our available resources, we were able to stabilize some staffing and minimize greater disruptions for some schools,” the emailed statement said.